Here is one of the latest maps via Al-Masdar News. Not only have all of the hills towards the west of Palmyra been brought under firm SAA control, which allowed them to rain down fire on the hapless Islamic State defenders, but according to the latest reports Palmyra Airport has also been captured. 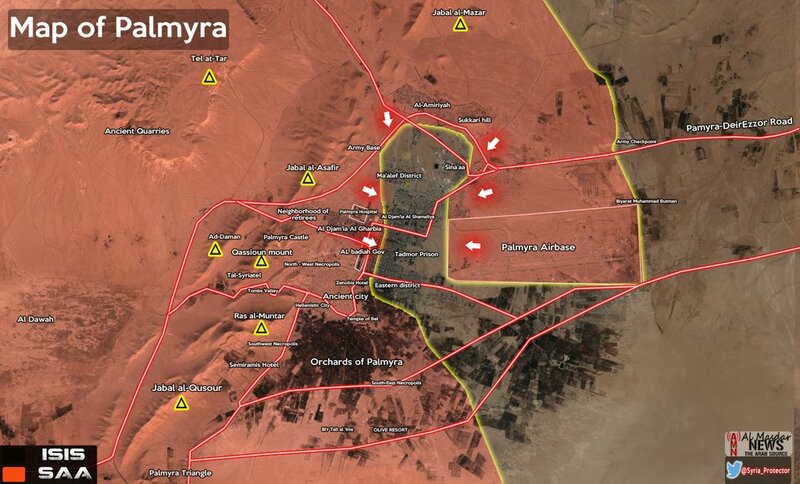 This means that Palmyra is as good as fully encircled, a development enabled in significant part by Russian air strikes in support of the SAA advance. Looks like Russia’s “retreat” wasn’t as total as some feared! The current Islamic State plan is to abandon positions and establish a new line of defense at Al-Sukhanah, which controls a vital crossroads triangulated between Palmyra, Deir ez-Zor, and Raqqa. This is a critical point, because its loss would practically bisect the Islamic State between Iraq and Syria. In general Islamic State seems to be pretty much falling apart now, showing up NATO/State Department claims about how Russia wasn’t doing anything against them for the self-serving lies they were. Front-line commanders no longer speak of a scarily formidable foe but of Islamic State defenses that crumble within days and fighters who flee at the first sign they are under attack. 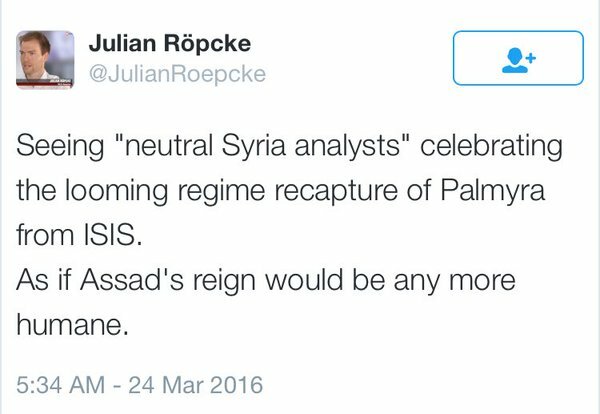 Of course seeing all this makes Atlanticist propagandists like Bild’s terminally Russophobic ISIS supporter Julian Roepcke very sad. Additionally, Palmyra’s liberation also means that the Islamic State will be deprived of the oil wells around Palmyra. This is not hugely important, since the Islamic State has always drawn the bulk of its revenues from tithes on locals even before Russia fighters put an end to their nice little oil smuggling arrangements with the Erdogan family. Nor will Syria itself will not be able to benefit immediately since it will take time to restore output and that’s making the bold assumption anybody will risk going there. I suppose there might also now be a trickle of archaeologists coming in to assess the scale of the damage Islamic State wreaked on Syria’s cultural heritage. Just as the original ruins immortalized the glory of the Roman Empire, so the ruins of those ruins – doubleruins? metaruins? either way, their Ruinenwert must have gone through the roof – will stand testament to the criminal malignancy of the neocons who helped enable all this. 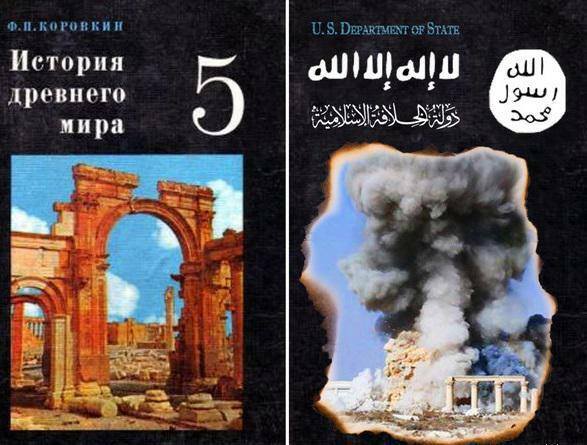 17 Comments to "Palmyra Liberated"
…. will stand testament to the criminal malignancy of the neocons who helped enable all this. People must never forget this. No one should ever give a damn if “David Frum is saying a lot of great stuff lately on immigration” or “Mark Steyn said something funny about cats”. All these neocons have earned lifetime bans from policy making or commentary. We don’t need them anyway; Trump has shown that. Several years ago, when I was posting on TAC, I posted a message making a favorable reference to a funny piece by Mark Steyn. Somebody else pointed out that Mark Steyn had strongly supported the Iraq War and had sat in as a replacement for Rush Limbaugh. I pleaded ignorance since I never read NR or listened to RL. I later discovered that Steyn had originally supported the Iraq War but had had a change of mind and subsequently concluded that it was a big mistake. Based on the pieces of his I read, I got the distinct impression that he had had a sincere change of heart and he articulated basically the principles of a non-interventionist foreign policy. Plus, he was strongly opposed to the theory of man-made global warming, and his articles are still pretty funny, which counts for a lot in my book. I would point out that at the time of the Iraq War polls showed that Americans overwhelmingly approved. When I expressed my opposition in a post on a Yahoo Finance Message Board (FON, 3/17/03), another poster responded that "you are in the minority, I hope you realize." I retorted that while I was in the distinct minority now just wait a few years so we can see how public opinion has changed. I would note that, after I started subscribing to TAC in early 2010, TAC added three new bloggers to its staff (while Ron Unz was the publisher of TAC, btw) who had been strong proponents of the Iraq War back in 2003: Rod Dreher, Noah Millman and Scott Galupo. I challenged each of them with messages when they started posting. I got the distinct impression that they had, in effect, signed a loyalty oath opposing foreign intervention in order to be consistent with the fact that TAC was founded by Pat Buchanan, Taki Theodoracopulos and Scott McConnell in opposition to the Iraq War. I subsequently formed the impression that the only liberal of the three, Noah Millman, had had a sincere change of heart. Judging from the posts of his I have read in the last couple of years, it seems pretty obvious that he is a very intelligent man, who, to all appearances, has learned from his past mistakes and has created a new intellectual framework which projects what he has learned from his past mistakes. With the other two, I got the distinct impression that they were simply going through the motions in order to get a new gig. I’m not seeing the victories in Iraq necessary to make IS defeat possible. But, yes, the IS is hurting in Syria from the South (Jordan-backed North Syrian Army), North (U.S.-backed SDF) and West (Russia-backed Syrian government). The only place it recently tried to expand was near the Israeli border (where it has had a presence for something like a year or two). Have to agree with you, Western media propaganda about Russia’s Syrian intervention is pathetic…but that’s to be exspected from the Lügenpresse. "Syrian president Bashar al-Assad’s forces entered the city on Thursday to recapture it from the Islamic State terrorist group." Thursday was March 24. March 25 was Friday. And yet the NY Times didn't get around to posting the news until Sunday morning (March 27) online. (The Sunday paper edition did not contain a story on Palmyra's reconquest. I first learned of the story when Chuck Todd made an announcement at the beginning of Meet the Press on Sunday morning, at 9 am EDT.) I wonder what took so long for the "paper of record" to get this important news out. Reality is making Donald Trump look good once again. Conversely, making the Russophobes (Kasich, Cruz, and Clinton) look bad. 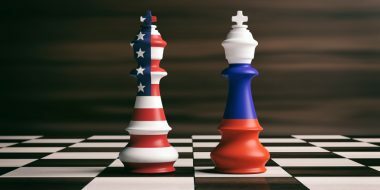 Anatoly, what do you see as the end game for Syria? Do you think the country will be split up, or do you see Syria and Iraq reforming their borders? Here’s what the US State Department had to say in response. Is this Röpcke a professional gayboy or just on the take? He's with BILD, they're total scum (very pro "refugees welcome" in the last few months). Employees there even have to sign in their work contracts that they'll be pro-US and pro-Israel in their reporting. He’s with BILD, they’re total scum (very pro “refugees welcome” in the last few months). Employees there even have to sign in their work contracts that they’ll be pro-US and pro-Israel in their reporting. JihadiJulian is hardly a phenomenon unique to Springer or the German lügenpresse. great news. theoretically this should mean that the refugees could start to come back to Syria. But of course this is not what is going to happen. Muslim refugees will point out that it is absolutely unconscionable to sent them back to a country reigned by somebody who is explicitly against implementing sharia law and against IS. Mr. Karlin, I posted on Israel Shamir’s blog on Friday a report in that day’s NY Times re the imminent capture of Palmyra by the Syrian forces. http://www.unz.com/ishamir/russia-bids-farewell/#comment-1368257 I was listening to Meet the Press this morning, and Chuck Todd reported the capture of Palmyra. I then posted the article in today’s NY Times (article appeared online, not in the print edition) re the capture of Palmyra. http://www.unz.com/ishamir/russia-bids-farewell/#comment-1369743 So the American MSM seem to be on top of this story, for a change. I recall reading recently that Syrian forces had already recaptured the oil fields surrounding Palmyra prior to yesterday’s recapture of the city. I am not that familiar with Syria’s geography, so I assume those are to the west of Palmyra. Are those the major oil fields that were supplying ISIS with the stolen oil it was selling to Turkey? Or are there others? I share your disgust at the role my country played in the destruction of those ruins, designated as a World Heritage Site by the U.N. Long after Obama declared war on ISIS in August 2014, the U.S. sat by while ISIS moved troops and supplies on the single road leading to Palmyra, which allowed ISIS to capture ISIS in the first place. Since the neocons were largely responsible for shaping our policy in that part of the world, that alone speaks volumes about the absence of humane values of those truly sick and incompetent assholes. I am still puzzled about Putin’s announcement of withdrawal. As Israel Shamir correctly pointed out a few days ago, his actions do not correspond to his words. Is he trying to give the world the impression that Russia played no role in Palmyra’s recapture in order to create the impression that the Syrian army did it on its own? (I heard a report that said Hezbollah also helped in the capture of Palmyra fwiw.) Perhaps to enhance Assad’s negotiating position in the peace talks? I heard it said a number of years ago that you can get a lot done in the political area as long as you don’t worry about who gets the credit. I am still puzzled about Putin’s announcement of withdrawal. Soon after the 2014 coup in Kiev Putin asked the Duma for permission to use Russian armed forces on Ukrainian territory. It was granted. Then, some time after the war began the permission was withdrawn, obviously with his consent. Yet Russian "vacationers" did not leave the Donbass after that. Actually, they participated in combat operations after that date. We should probably see these public declarations as a part of the information war. Retaliation against Jordan for the facilities the rebels are given. ISIS in Syria will be channeled to expand at the expense of the FSA Southern Front and if the Hashemite state falls Israel will become involved, with the prospect of doing what it refused to give assurances it would not do during Gulf war 2. The neocons don’t dare dream of any of this, because they avoid noticing the real threat to Israels’ future as a Jewish state which is internal and without a direct connection to countries like Iran. Mr. Karlin, I posted on Israel Shamir's blog on Friday a report in that day's NY Times re the imminent capture of Palmyra by the Syrian forces. 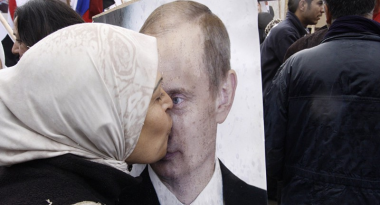 http://www.unz.com/ishamir/russia-bids-farewell/#comment-1368257 I was listening to Meet the Press this morning, and Chuck Todd reported the capture of Palmyra. I then posted the article in today's NY Times (article appeared online, not in the print edition) re the capture of Palmyra. http://www.unz.com/ishamir/russia-bids-farewell/#comment-1369743 So the American MSM seem to be on top of this story, for a change. "Additionally, Palmyra’s liberation also means that the Islamic State will be deprived of the oil wells around Palmyra." I recall reading recently that Syrian forces had already recaptured the oil fields surrounding Palmyra prior to yesterday's recapture of the city. I am not that familiar with Syria's geography, so I assume those are to the west of Palmyra. Are those the major oil fields that were supplying ISIS with the stolen oil it was selling to Turkey? Or are there others? "so the ruins of those ruins. . .will stand testament to the criminal malignancy of the neocons who helped enable all this." 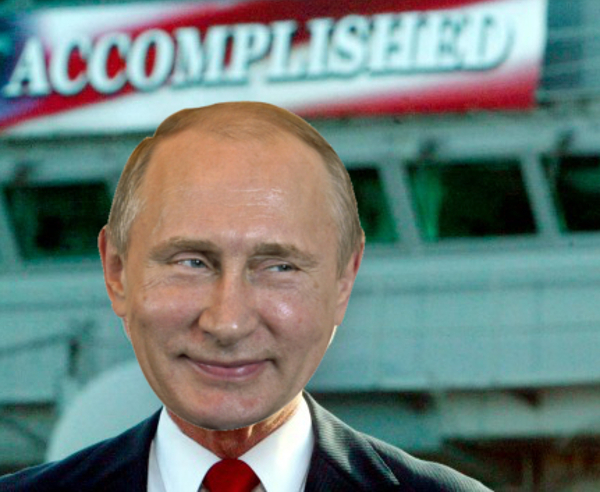 I am still puzzled about Putin's announcement of withdrawal. As Israel Shamir correctly pointed out a few days ago, his actions do not correspond to his words. Is he trying to give the world the impression that Russia played no role in Palmyra's recapture in order to create the impression that the Syrian army did it on its own? (I heard a report that said Hezbollah also helped in the capture of Palmyra fwiw.) Perhaps to enhance Assad's negotiating position in the peace talks? I heard it said a number of years ago that you can get a lot done in the political area as long as you don't worry about who gets the credit. Soon after the 2014 coup in Kiev Putin asked the Duma for permission to use Russian armed forces on Ukrainian territory. It was granted. Then, some time after the war began the permission was withdrawn, obviously with his consent. Yet Russian “vacationers” did not leave the Donbass after that. Actually, they participated in combat operations after that date. .... will stand testament to the criminal malignancy of the neocons who helped enable all this. People must never forget this. No one should ever give a damn if "David Frum is saying a lot of great stuff lately on immigration" or "Mark Steyn said something funny about cats". All these neocons have earned lifetime bans from policy making or commentary. We don't need them anyway; Trump has shown that. I would point out that at the time of the Iraq War polls showed that Americans overwhelmingly approved. When I expressed my opposition in a post on a Yahoo Finance Message Board (FON, 3/17/03), another poster responded that “you are in the minority, I hope you realize.” I retorted that while I was in the distinct minority now just wait a few years so we can see how public opinion has changed. Have to agree with you, Western media propaganda about Russia's Syrian intervention is pathetic...but that's to be exspected from the Lügenpresse. Thursday was March 24. March 25 was Friday. And yet the NY Times didn’t get around to posting the news until Sunday morning (March 27) online. (The Sunday paper edition did not contain a story on Palmyra’s reconquest. I first learned of the story when Chuck Todd made an announcement at the beginning of Meet the Press on Sunday morning, at 9 am EDT.) I wonder what took so long for the “paper of record” to get this important news out.